Senate Majority Leader Mitch McConnell announced he plans to take action on the bill next week. The U.S. Senate will get to see the new version of the health care bill later this week. Senate Majority Leader Mitch McConnell said he plans to release the new bill on Thursday. It comes two weeks after he announced his decision to delay the vote on the previous health care bill. At the time, McConnell didn't have enough votes to move forward with the measure. "We're still working toward getting at least 50 people in a comfortable place," McConnell said on June 27. Republicans at both ends of the conservative spectrum took issue with the bill for different reasons. It remains to be seen whether the new bill will be able to bridge the divide. As Politico reports, some Senate Republicans are pessimistic about their ability to repeal the Affordable Care Act. McConnell said he expects to move forward with the bill next week once the Congressional Budget Office releases its analysis. And on top of that, he said there is other business that needs to be addressed. "We're going to turn to other issues ... among them defense authorization, the FDA user bill, a must pass bill to fund the FDA. 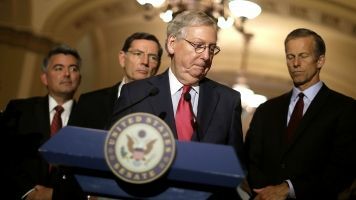 We have to do a debt ceiling increase," McConnell said at a Republican Senate leadership press conference. So McConnell announced Tuesday he's delaying the Senate's traditional August recess. That will give senators the first two weeks of August to tackle those measures.